AKASHI, Hyogo Prefecture--In a scoreless game that spanned four days and captivated a nation, Chukyo High School broke through with three runs in the 50th inning to beat Sotoku High School in the semifinals of the 59th National High School Rubber Baseball Tournament here on Aug. 31. If that wasn't enough for the weary players, Chukyo, of Gifu Prefecture, defeated Miura Gakuen High School from Kanagawa Prefecture 2-0 in the championship game in the afternoon at Akashi Tocalo Baseball Stadium. Chukyo starting pitcher Taiga Matsui, who threw 709 pitches in the 50 innings, had enough left to come on in relief in the fourth inning of the final game and pitch the rest of the way. Along with Matsui's herculean effort, Jukiya Ishioka of Sotoku, of Hiroshima Prefecture, also threw all 50 innings in the semifinal, totaling 689 pitches. It marked the first time in two years that Chukyo captured the championship and also the seventh victory for the high school in the tournament played with a rubber baseball instead of the harder ball. In the semifinal, the game was suspended in a scoreless tie after the 15th inning on Aug. 28. The extended contest continued from the 16th inning to the 30th inning on Aug. 29, and from the 31st inning to the 45th inning on Aug. 30 but was still deadlocked at 0-0. On Aug. 31, however, Chukyo broke the tie in the top of the 50th inning and won 3-0, putting it in the record books as the longest game in tournament history. The previous record was 25 innings. According to the tournament rules, if the game was still tied after 54 innings, the winner would have been decided in a drawing. 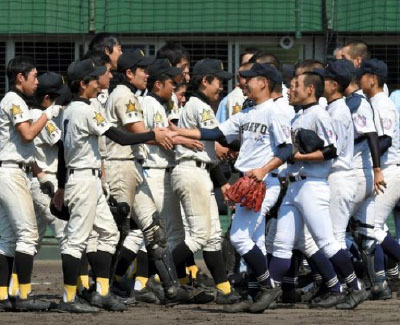 The tournament was held under the sponsorship of the Japan High School Baseball Federation, The Asahi Shimbun Co., The Mainichi Newspapers Co. and other organizations.